In the last few years, the interest as well as investment in cryptocurrency has been on the rise. Therefore, it has become increasingly important to create safe and secure exchanges that facilitate the purchase of cryptocurrency. One of the most popular cryptocurrency exchanges that are available these days is Coinbase. Based in San Francisco, Coinbase was launched in 2012 and currently operates in almost 32 countries. Since its launch, the exchange has helped approximately 12 million customers in exchanging more than $40 billion in digital currencies. Within a year of its launch, Coinbase became the highest funded Bitcoin startup and also the world’s largest cryptocurrency exchange. Coinbase is different from other crypto exchanges because it doesn’t require its users to trade on a market; people trade their cryptocurrencies at a set price, which is based on their market value. In this way, users are able to buy their cryptocurrencies quicker than other exchanges. Another important feature that makes Coinbase different from others is that it accepts credit cards, along with bank transfers. Depending on the payment method you use on Coinbase, the fee you have to pay is between the ranges of 1.49 percent to 3.99 percent. Credit card transactions will cost you higher. Nonetheless, the fee charged by Coinbase is generally lower than competitors such as CEX or Coinmama, which follow a similar business model. Currently, users can purchase Ethereum, Litecoin and Bitcoin via Coinbase and it has also added Bitcoin Cash (BCH), Ethereum Classic (ETC) and 0x (ZRX) to its list. The GDAX exchange, now known as Coinbase Pro, is also operated by the exchange, which is aimed at professional traders. 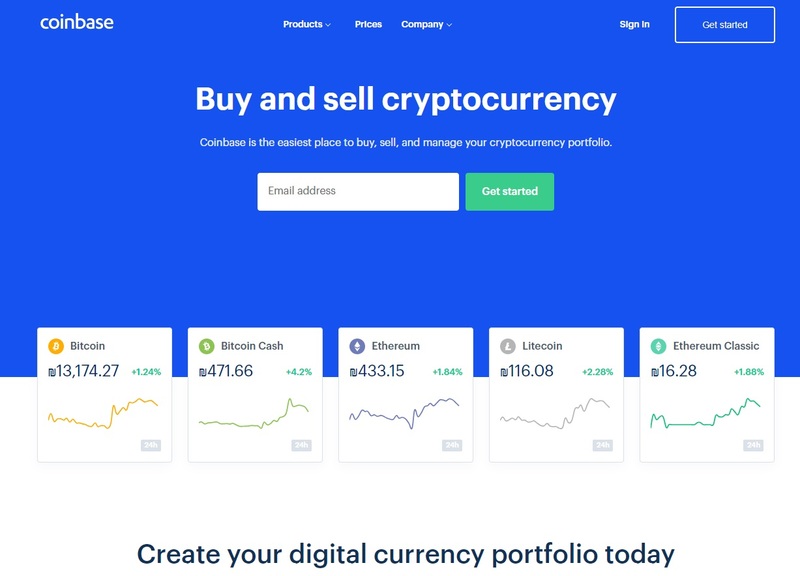 As compared to the traditional Coinbase service, Coinbase Pro is better suited to experienced traders. The fees is generally lower and advanced trading options are available. The exchange launched its own independent mobile wallet for Android and iOS in 2018. The private keys are stored by the wallet on the user’s device and only they can access the funds. In this way, Coinbase has come full circle as it began as a wallet, transformed into an exchange and is now offering wallet services once again. The sign up procedure for Coinbase is quite simple. The first step requires you to enter your name, email address and password. Next, you have to choose the account type you prefer i.e. whether you want to open an individual or business account. Verifying your phone number is the third step. The purpose of this step is to ensure 2-factor authentication for keeping your account secure. Once you have completed these steps, you need to select a payment method for funding your account on Coinbase. After all, you cannot buy cryptocurrencies if you don’t have any funds. The time required varies, depending on the payment method you select. Once you have added funds to your account, you can buy the cryptocurrency of your choice. After your transaction is confirmed, the cryptocurrency will be credited to your wallet. One of the perceptions amongst newcomers about cryptocurrency is that it is risky to invest in. To some extent, this is quite true because the security of some cryptocurrency exchanges have been compromised in the past. However, when it comes to Coinbase, it is one of the most secure platforms that are currently running. First and foremost, the exchange is based in the US, which means that it has to comply with the US State and Federal law. In contrast, other exchanges are based in countries where the regulations are much more lenient and this can lead to risks. Coinbase is also quite secure when it comes to storage of funds. Company operational funds are segregated from customer funds and this is another form of assurance. In case of bankruptcy, users don’t have to worry about losing their money as it is kept in custodial bank accounts and will not be used by the exchange or its creditors. The cryptocurrency funds are also kept offline in the form of paper wallets and hardware wallets that are kept in safety deposit boxes and vaults worldwide. Only 2 percent of cryptocurrency funds are kept online and they are fully insured. Customer support is offered by Coinbase via email and users can also gain access to an FAQ and Knowledge Base page that’s been designed for customers. As far as wait times are concerned, they may vary, but generally a response is provided as quickly as possible. The responses are also precise and aim to solve the issue as efficiently as possible. Coinbase can be used by people in numerous countries, which are Austria, Hungary, Portugal, Switzerland, Australia, San Marino, Finland, Netherlands, Sweden, Canada, Croatia, Poland, Lichtenstein, Cyprus, United Kingdom, Spain, Norway, Denmark, Czech Republic, Belgium, Italy, Singapore, Jersey, Slovenia, Bulgaria, Greece, Latvia, Slovakia, Malta, Denmark, Monaco and the United States. Custodian services, which are designed to safeguard cryptocurrencies on behalf of institutional investors. Coinbase Index, which can be useful for tracking the financial performance of all assets listed on the exchange. Paradex is a platform that has been created for trading directly from the wallet. com is also a service that was acquired for the purpose of filtering out spam emails. Depending on the country, the transaction limits tend to vary and they may also vary due to a user’s verification status and payment method in use. The limits can be viewed via a link that’s present on the account’s limit page. Users of the exchange also have the option of applying for higher limits, but these limits may not be extended to credit card transactions. To get higher limits, users will have to verify their identity. US residents will be able to conduct transactions of $50,000 per week whereas verified European customers will be able to have $30,000 in their account. Coinbase is an easy to use and a practical cryptocurrency exchange that newbies can use without any hassle.